NATO wants the agreement with the United States signed before it finalizes its own accord with the Afghan government, as it is to be modeled after the one Afghanistan reached with the Obama administration. 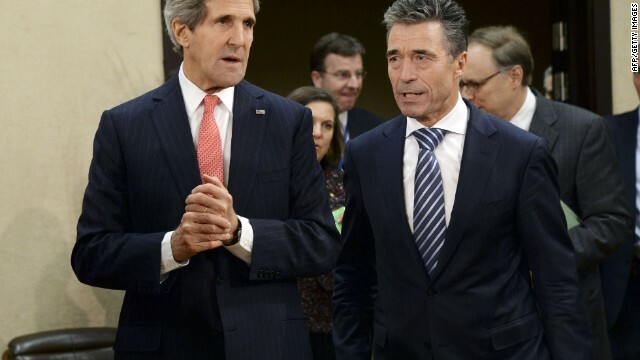 Without it, Secretary General Anders Fogh Rasmussen warned the alliance would be unable to shape a future military presence. "In that case, we don't have a proper legal framework in place and it will not be possible to deploy a 'train, advise, assist' mission to Afghanistan after 2014," he said, adding he hoped Karzai would follow the advice of the Loya Jirga and sign the agreement. "It is my firm hope and intention, therefore, to continue our efforts to support Afghanistan, once these agreements are concluded," Rasmussen said. Because the United States is expected to supply the bulk of forces for any post-2014 mission, any presence is unlikely without a signed agreement between Washington and Kabul. Karzai has said he won't sign until certain conditions are met. These include promises from the United States of no more raids on Afghan homes and that Afghan prisoners will be released from the Guantanamo Bay detention center. Washington has resisted such changes, saying Karzai's demands are new provisions added to a deal that was already reached. National Security Adviser Susan Rice traveled to Kabul last week, where, according to senior U.S. officials, she warned Karzai the United States would begin pulling out troops in 2014 if he failed to sign the agreement by the end of the year. "We consider that the Loya Jirga represents the will of the Afghan people, and it's time to move on with it," a senior State Department official said. PA/Associated Press – Editor of The Guardian newspaper Alan Rusbridger gives evidence to the Commons Home Affairs Committee hearing on counter-terrorism at Portcullis House, central London, Tuesday, Dec. 3, 2013. Alan Rusbridger has been questioned by Parliament’s home affairs committee as part of a session on counter-terrorism, following The Guardian’s publishing of a series of stories based on Edward Snowden’s leaks disclosing the scale of surveillance by spy agencies in the United States and Britain. The editor of The Guardian says his newspaper has published just 1 percent of the material it received from former National Security Agency contractor Snowden and “made very selective judgments” about what to publish and had not revealed any intelligence staffers’ names. He said: “We have published no names and we have lost control of no names.” Government and intelligence officials have said the leaks compromised British security and aided terrorists. Deny Karzai sanctuary outside of Afghanistan. What we need to do is to get both the Karzai regime and the Taliban to the negotiating table. Anything else is a sheer waste of time and money!! !